In September 1940 Field Marshal Wilhelm Kei­tel, chief of the Ger­man high com­mand, an­nounced that Wehr­macht troops were being sent to Roma­nia “in case a war with Soviet Russia is forced upon us.” Early the next month Ger­man troops entered the coun­try osten­sibly to train and re­build the Roma­nian military after King Carol II ab­di­cated in favor of his 19‑year‑old son Michael (Mihai). Actually the Ger­man pre­sence pro­tected Roma­nia’s dozen oil fields in and around Ploesti (Ploieşti), which had become vitally im­por­tant to the Ger­man war effort since Ger­many itself pos­sessed virtually no oil out­side syn­thetic oil labo­ri­ously ex­tracted from the nation’s plenti­ful coal de­pos­its. 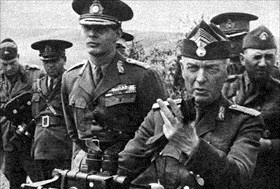 On this date in 1940 Roma­nian dic­ta­tor Marshal Ion Anto­nescu followed neigh­boring Hun­gary into the Axis Tri­partite mili­tary pact. The pact, signed at its out­set by repre­sen­ta­tives of Ger­many, Italy, and Japan on Septem­ber 27, 1940, in Berlin, pledged mem­ber states to fight any state that declared war on another treaty mem­ber. Anto­nescu’s deci­sion to throw his coun­try’s lot in with other Axis states—Slo­va­kia, a pup­pet state from dis­mem­bered Czecho­slo­va­kia, joined the next day—had devas­tating and long-term con­se­quences for his coun­try when Roma­nia became Adolf Hitler’s prin­ci­pal spear carrier in East­ern Europe. (Roma­nians sent to fight in the Soviet Union exceeded the num­ber of all of Ger­many’s other allies com­bined, in­cluding Italy.) In the fighting around Stalin­grad (Volgo­grad) alone (Novem­ber 1942 to the end of Janu­ary 1943), Roma­nian Third and Fourth Army dead, wounded, and missing approached 160,000 men (one source says 200,000), with heavy losses in artil­lery, armor, and air­craft. Some 3,000 Roma­nians entered Soviet cap­tivity. The stag­gering losses effec­tively ended Roma­nia’s offen­sive capa­bility for the remain­der of the war and pushed the coun­try into exploring ways to with­draw from the con­flict. In the fall of 1944, with the U.S. Army Air Forces ham­mering Roma­nia from above, a resur­gent Soviet Union over­ran Roma­nia, forcing an armi­stice. Roma­nia’s defec­tion signifi­cantly hastened the end of the war. Her nat­u­ral resources were now denied to Ger­many and her forces con­sti­tuted the fourth largest Allied army. Of the 538,000 Roma­nian soldiers who fought the Axis in 1944–45 (in Hun­gary, Yugo­sla­via, Aus­tria, and Czecho­slo­va­kia), some 167,000 were killed, wounded, or went missing. Left: As a member of the Axis, Romania joined the inva­sion of the Soviet Union on June 22, 1941 (Opera­tion Barba­rossa). Roma­nian forces played a large role during the fighting in Bessa­rabia, which the Soviets occu­pied in 1940 in the wake of the 1939 Molotov-Ribben­trop Pact, as well as in the Ukraine, Crimea, and Stalin­grad. In this photo­graph King Mihai I (left) and Gen. Ion Antonescu are seen inspecting the Bessa­rabia front in July 1941. 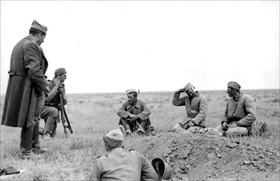 Roma­nian troops suffered heavy casu­al­ties retaking Bessa­rabia: 22,765 men and 58 air­craft. Soviet losses were 17,893. On August 21, 1941, as a reward for com­manding the troops that returned Bessa­rabia and North­ern Buko­vina to Roma­nia, Mihai confirmed the rank of Field Marshal on Antonescu. 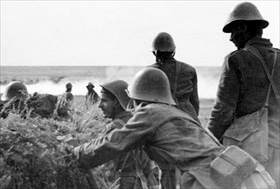 Right: Romanian troops in the Don-Stalingrad area, mid-1942. The Roma­nians reached the Don River on July 27, where they began assisting Ger­man troops. In early August the two armies had broken through Soviet defenses. In Septem­ber the Third and Fourth Roma­nian Armies took up posi­tions around Stalin­grad, as did the Ger­man Sixth Army, the German Fourth Panzer Army, the Ital­ian Eight Army, and the Hun­garian Second Army. At the same time the first ele­ments of the Roma­nian Air Corps arrived on the Stalingrad front. Left: Romanian forces took part in the Axis Crimean cam­paign of 1942. This photo­graph depicts Roma­nian sol­diers with Soviet POWs during a rest period. The fighting around the strate­gi­cally impor­tant Soviet naval base at Sevas­to­pol con­tinued until July 4, 1942, when the cam­paign ended. The Red Army suffered 50,000–60,000 ca­su­al­ties and the loss of about 95,000 taken cap­tive defending the city. Axis armies lost 35,559 men, of which 8,454 were Roma­nian, during the same battle. The total num­ber of casu­al­ties suffered by Roma­nian troops during the 295 days of the Crimean cam­paign was about 19,000. 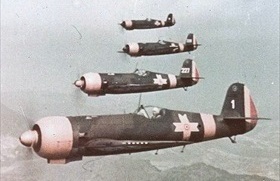 Right: The IAR 80 was the main Romanian fighter during World War II, remaining in front-line use until the 1944 armis­tice. Some 346 units were pro­duced up to Septem­ber 30, 1944. When the IAR 80 entered service in 1939, it was com­pa­rable to the Ger­man Messer­schmitt Bf 109E, the Brit­ish Hawker Hurri­cane, and the U.S. Curtiss P‑40 War­hawk. In the summer of 1943, IAR 80s were transferred to Roma­nia for air defense duties, where they were used in com­bat against low-flying, four-engine U.S. B‑24 Libe­rator attacks on the oil refin­ery instal­la­tion at Ploieşti. According to Roma­nian statis­tics, on August 1, 1943, IARs and Messer­schmitts shot down ten B‑24s, with two proba­bles. On June 10, 1944, IAR 80s and German-piloted Messer­schmitts took part in one of the major air battles over Roma­nia when 36 U.S. P‑38 Light­ning dive bombers, carrying one bomb each, attacked Ploieşti. The U.S. lost nearly two dozen P‑38s to the Axis two.